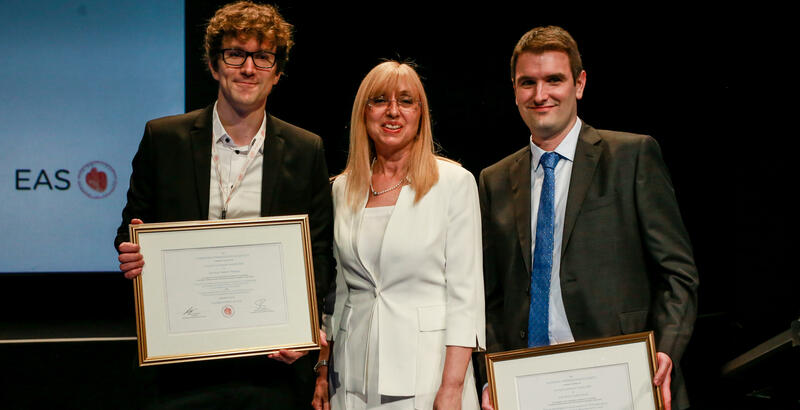 Prize recepients 2018: Christian Medom Madsen, Denmark and José Javier Fuster Ortuño, USA were awarded by EAS President Lale Tokgözoglu at EAS 2018 in Lisbon, Portugal. The recipient will be awarded with € 2000 and travel support to attend at the annual EAS Congress 2019 in Maastricht, the Netherlands to receive the prize during the Congress Opening Ceremony on Sunday evening, May 26, 2019. Nominations are open for EAS members, however the nominee does not need to have an EAS membership. The nominated article should have been published January 01-December 31, 2018, and be in English.